What's not to love? 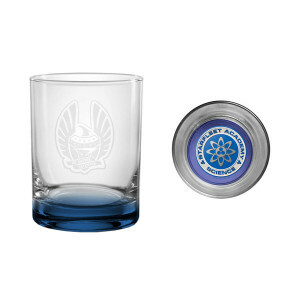 Nice, heavy-weight glass with top-quality etching and design. I'm almost afraid to use it because it's so cool. I've already warned my kids to "be careful with Mom's special glass" when loading the dishwasher. Highly recommend. I've gotten four of the Academy glasses now for a set; I love them. The quality of the glasses is excellent: heavy, sturdy, and flawless. I am a big Star Trek fan, so having the glasses identify with Star Trek Academy with wonderful, and the colors of the different departments are beautiful. I may have to order two more. Lovely! Beautiful blue color for Science. A Spock Fan. Very nice and heavy glasses. They were a birthday present and he really enjoyed them.